On this page you will find a great collection of patriotic messages and Independence Day quotes. Independence days are celebrated annually in respect and remembrance of a long awaited freedom of the country. It is a national holiday. It is a time to feel the pride and to show respect for every freedom fighter that have shed their blood for their country’s freedom. We all are so different, but there is one thing that unites us and it’s independence. We should honour it and never forget how hard it was to get it. 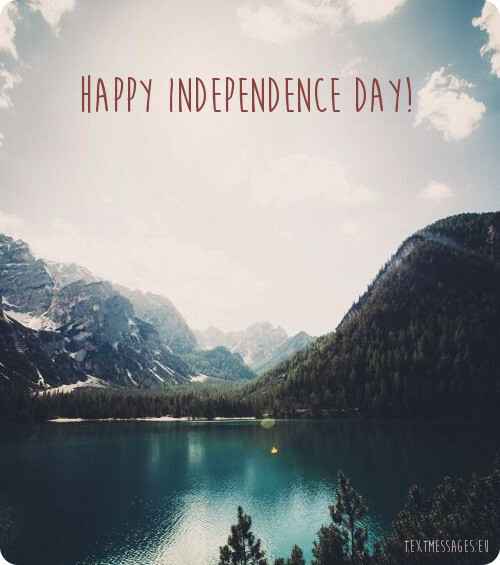 Enjoy this beautiful Independence Day! From all of my heart I want to congratulate all people with this wonderful day. It‘s a big day for our country. Wish the best Independence Day! Your true freedom begins when you get to a point where you don’t have to impress anyone in life! Happy Independence Day! My love for my nation is worthiness. My love for my people is endless. All I desire for my country is happiness. Let me be the first person to wish you a special happy Independence Day! It’s been more than two centuries since our grandparents won our first and most crucial battle, but we still can feel the taste of freedom and independence. It is something we will cherish until the end. Happy Independence Day! Without freedom, we don’t have a name, one vision, one identity, one nation. If our country is worth dying for during wars, we should also realize that it’s worth living for in time of peace! On this day, we come together, we unite and make it another beautiful day to speak and fight against corruption while we spiral the flag of our beautiful nation. Let us honour every patriot, because without them, freedom would not have existed. What they did, we can never repay. Happy Independence Day! Let’s make a strong decision, to value our nation and never forget the sacrifices from those who gave us freedom. Happy Independence Day! Let’s celebrate and enjoy the freedom giving us a possibility to live independently, helpfully, cheerfully, hopefully by reflecting on our past and remembering our national heroes who gave us total freedom after years of pain and humiliation. Freedom is in our minds, faith is in our words, pride is in our hearts and great memories are in our souls. Let’s celebrate our great nation on this Independence Day! Independence Day is here again, fire the guns and shout aloud for freedom, hail the stars and stripes forever, best flag in the world. It is a great time for you to show the act of freedom. Make yourself known. Never follow others footsteps, free yourself, after-all you are independent! Happy Independence Day. Let’s raise our hands and celebrate this day, let’s stand up so high to show respect for the great ones who died for our independence, let’s sing our national anthem with flags in hand and celebrate this wonderful day! Let’s salute our martyrs for the sacrifices they made and appreciate them for giving us today. Happy independence! As you celebrate this day, always have it in mind that no nation is perfect and it can only be made perfect by me and you. Happy independence, proud to be a citizen! Happy Independence Day to everyone, I wish you all faith in the words, freedom in the mind and pride in your souls. Let’s salute this glorious nation on its Independence Day! Independence is a special and precious gift of God. May our lives always remain independent, happy Independence Day. Hope you can feel the pride of being a part of this glorious nation. Here is my warm patriotic wish to make this unique day truly memorable. My heart beats with pride when I see the amazing colours of Independence spreading joy and happiness all around us. May the glory of this day be with you forever, happy Independence Day! Celebrate the free spirit of our nation, may this Independence Day fill your life with joy and prosperity. Happy independence! Today, we stand up so high. Shed those tears as we all remember all that died for me, you and our whole country, risking their precious lives each and every day. To our martyrs, here is our salute. Happy Independence Day. Today is the day, that our nation sings aloud, this is the day, that our liberty bells rings aloud, this is the day we shall start to remember what we truly stands for and celebrate our independence. Happy Independence Day. So many people might have forgotten, but I never will, the colourful flag of my country, furls so high. Happy Independence Day. Thousands of people laid down their dear lives for our country to breathe this day, we should never forget their sacrifice…happy Independence Day! The nation will forever remain the land of the free as long as it’s the home of soldiers and the braves. Happy Independence Day! Let’s make strong decisions to value our dear nation. We will never forget the sacrifice our freedom fighters had made. Now it’s our turn to reform the country. Happy Independence Day! On this wonderful day, let us all remember and salute the soldiers who lay down their lives to protect our dear nation. Happy Independence Day! This day is special and we all know why. It brought us freedom and happiness and we will never trade if for anything in the world, right? Happy Independence Day! Being independent is what we all wanted. And look at us now, we are a mighty country. Being independent was the best thing that could have happened to our country. Without the final battle, we wouldn’t exist at all. That is why I’m so grateful it happened. Have a happy Independence Day! Some people say that this day is not to be celebrated, but I often ask myself why. It’s a day which resembles a lot of happiness, because on this day we became and independent country! Happy Independence Day! Being independent is everything we ever wanted. We fought for it bravely and we finally won it with the expense of so many lives. But if something threatens our independence, we’ll fight for it one more time! Have a great Independence Day! And we are proud of who we are. This day means life without boundaries and limits. It’s our freedom day, our Independence Day! Time to celebrate! 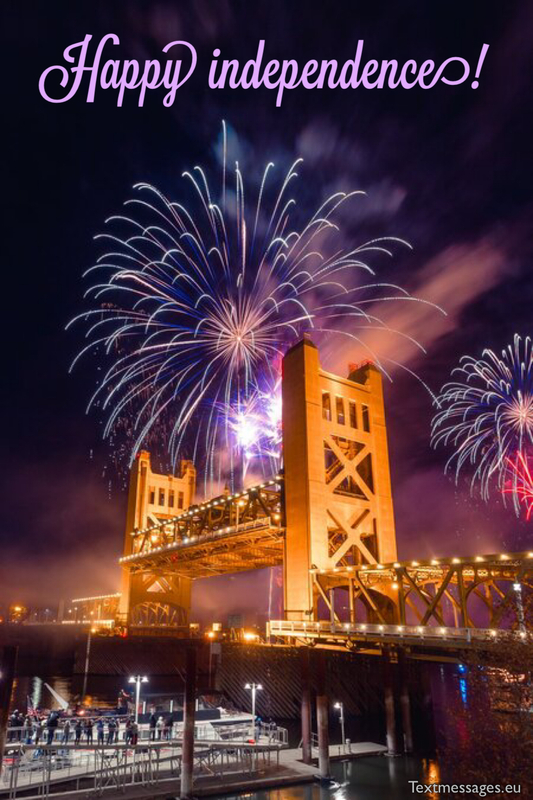 On this day I want to congratulate our state and its people with Independence Day. This day is very significant in our history. Enjoy it! I want to congratulate all of us with our people freedom day. This day is a sign that we can do everything what we want to do. This is an amazing day! Do you remember a film about Independence Day? I hope that this will never happen to us. Celebrate this day! Can you imagine a day without a right to be free? I can’t. So, let’s celebrate our Freedom day! I want to enjoy this unforgettable day. It‘s a day of our nation‘s success. Greet one another! I know that you don‘t like any sophisticated days but today is time to celebrate our independence. It‘s a grand day! It‘s a unique day for our nation. This day is special not only for our grandparents but also for us. Have a great independence day! Let‘s start this day with important announcement. Today it‘s our independence day. I hope that all of you will have a great free day. Happy Independence Day for all of us! Let this day be incredible. We have a right to be what we want. Do you know what day is today? It‘s our freedom day. It gave us unlimited space to do everything that we want. I‘m very happy that this day gave me an opportunity to be myself. I‘m free and independent person. It‘s very important for me. It‘s a huge achievement for our state. We have a chance to be free. I am very glad! Today is a great day for all of us. It‘s our freedom and independence day. I hope that it will never end. Today I wish to congratulate all people with this significant day. 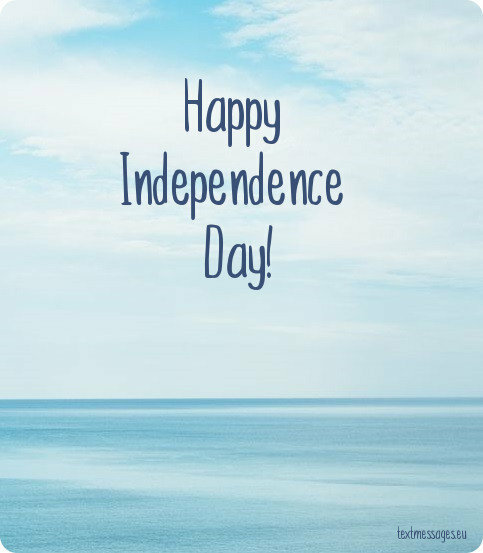 Our independence – it‘s our beginning of everything. Congratulations on this great day!